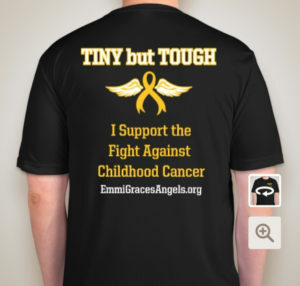 In honor of Emmi’s upcoming 2nd birthday, we have launched our newest fundraiser. Those amazingly comfortable shirts that were available last year are back and better than ever with a new design! Did you know that there are children who are medically ready for discharge but have to stay in-patient because their insurance does not cover the cost of the medical supplies they would need to go home? Or because they are underinsured or uninsured? Can you imagine having a child with cancer and stuck in the hospital- not because of necessary treatment but because you simply cannot afford to take them home?? On average, it costs about $1500 for a child to get the necessary supplies to go home! Well, for Emmi’s birthday, we are aiming to get as many of these kids home for the holidays as we can and we need your help! Making a direct donation to EGA. This can be done through PayPal or you can simply mail us a check. However you decide to help, we thank you!! Click this link to order your shirts now! Fundraising to Get Kids with cancer Home for the Holidays!